Brownish-Green Mites Invade Homes - Oh, My! Clover mite, about the size of a period(.). Have you ever found brownish-green mites that seem to be invading your home? You may have found large numbers around a window or on a counter top. If you crushed the mites they left a greenish stain. If you looked closely, you might have seen long front legs like the mite in the photo (left). These long legs are often mistaken for antennae. You probably found clover mites. 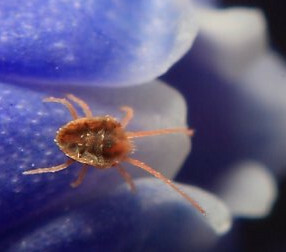 Clover mites are a type of spider mite that feeds on plants and they occasionally enter homes from plants growing along the foundation of your home, entering through open windows or cracks. Most spider mites rarely if ever leave their host plants but clover mites are a little different. For reasons that are not entirely clear these mites will start a sort of "mass migration", often in the spring, that can end with large numbers of mites on your interior walls and counters. Rest assured the mites are harmless except for the potential for staining of interior furnishings if crushed. They do not bite and will not infest food or other household items. In fact, mites that are found inside can be simply swept up, insecticides are not needed nor are they very effective in this case. The key to stopping mites from entering homes is to manage the source - the plants growing around your home's foundation. Plants can be removed or simply cut back so they don't lay against the house. Try to maintain a gap of at least 12". I've recently posted an article at our 'Bugs site that spells out more ways to manage clover mites and keep them outside (click here).